Early signs: The overlap between autism traits and gender variance may appear as early as 6 years of age. Traits associated with autism and gender variance co-occur even among typical children, a new study suggests1. The finding may ease some of the skepticism about the overlap between autism and gender nonconformity. 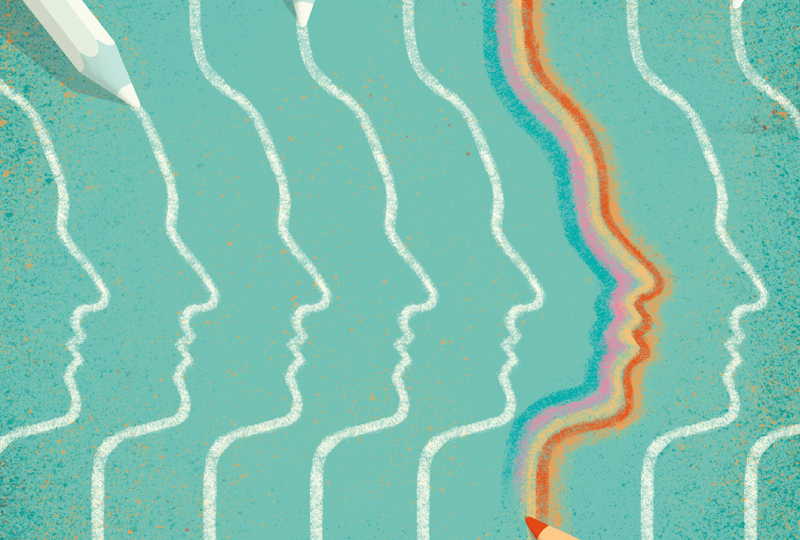 In a commentary published earlier this month, two physicians questioned whether the link between autism and gender dysphoria — distress over the mismatch between the gender assigned to a person at birth and the gender they identify with — is real2. The commentary drew swift rebuttals in the journal from scientists who study the overlap, who argue that “perpetuating misunderstanding” about the link delays these autistic individuals’ access to care. “The more people that are willing to recognize [the overlap] and screen for it and be curious about it, the better served our patients will be,” says Aron Janssen, associate professor of child and adolescent psychiatry at New York University’s Langone Medical Center, who co-wrote one of the letters to the editor. Because the field is still evolving, the exact numbers for the overlap between autism and gender variance vary widely: Between 6 and 26 percent of gender-variant people meet the criteria for autism3,4; conversely, between 4 and 8 percent of autistic people are gender variant5,6. Most of these studies analyzed either autism traits among people who visit gender clinics or gender variance among people diagnosed with autism. By contrast, the new work reveals an association between gender variance and autism traits among 6- to 12-year-old children in the general population. VanderLaan’s team used social media and advertisements to recruit parents of 2,445 children. Of these children, 441 have a developmental or psychiatric condition; 80 have autism. Parents completed the Gender Identity Questionnaire for Children, a 16-item scale that assesses gender variance. They also filled out the Children’s Social Behavior Questionnaire, which rates autism traits, such as difficulty playing with peers. Children who have social difficulties or stereotyped behaviors tend to score high on the gender-variance questionnaire, the researchers found. Those who have a diagnosis of autism — as reported by their parents — score even higher. The findings appeared in December in the Journal of Autism and Developmental Disorders. Gender variance also tends to accompany oppositional defiant disorder or sensory processing disorder — but not attention deficit hyperactivity disorder or mood conditions, the study found. The focus on children under age 13 is a novel aspect of the study, says John Strang, director of the Gender and Autism Program at the Children’s National Health System in Washington, D.C.
“Some people have suggested that the co-occurrence of autism and gender diversity was really a phenomenon that was primarily seen in adolescence, and this study suggests that it is broader than that,” says Strang, who was not involved in the research. However, some experts say the link between autism and gender variance is tenuous. In a letter responding to the commentary, Strang and others cited several studies that used clinical diagnoses of autism and still came to the conclusion that autism and gender variance are linked3. Dismissing gender variance as another manifestation of autism could delay autistic people’s access to medical options for their gender variance, says Dana Rofey, associate professor of psychiatry, pediatrics and psychology at the University of Pittsburgh, who also signed the letter. The skeptics and supporters all agree on one point: We need more studies on autistic people with gender variance. Janssen points to the emerging “stream of articles” as a sign that more researchers are interested in studying the overlap.